Atlanta Hartsfield International Airport - World's Busiest Airport! Welcome to the busiest airport in the world! 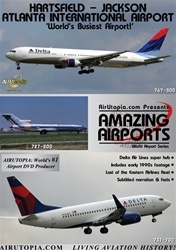 Join AirUtopia at Hartsfield-Jackson Atlanta International Airport for amazing airport action including both classic 1990s footage and modern-day 2008 footage. See the final Eastern Airlines fleet that was parked when services ended in 1991 and the present-day fleet of Delta Air Lines and the many other carriers that make Atlanta the Mega-Airport that it is today!Last of the TAO A310s!